Mark: Hi, it's Mark here with Top Local. We're here with Mr. Bernie Pawlik, Pawlik Automotive. We're doing the Pawlik Automotive podcast and we're talking trucks. Hey, Bernie. How are you doing this morning? Mark: This is a 2007 Ford F150, one of your favourites. You guys see a lot of Fords. Mark: This is a brake repair. What was going on with this Ford vehicle? Bernie: This vehicle came to our shop, towed in actually. The owner was driving it. His description, there was a clunking sound. The vehicle didn't move properly afterwards, so had it towed in. We managed to drive it into the shop. It was difficult. We managed to drive it into the shop, put it up on hoist, and inspected it. What we found was a grotesquely, seriously worn front left brake. 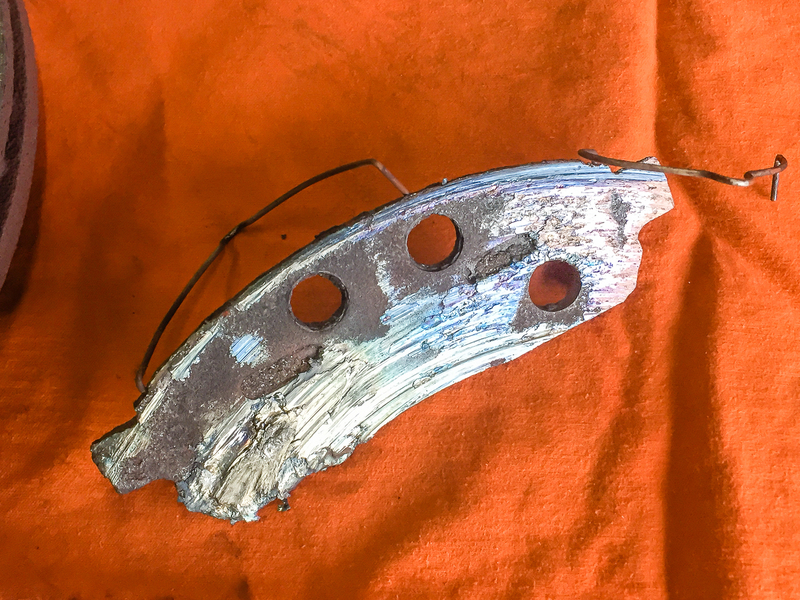 It basically had been worn so badly metal on metal the pad had jumped out of place, jammed up between the caliper bracket and the rotor, and the vehicle would barely move. Mark: Okay. The obvious question is would there have been some noise before it was that bad to actually freeze the wheel, and wouldn't they have heard the noise? Bernie: They would have definitely heard the noise. There would have been a lot of noise and for probably quite a long time. I don't know how long, and I never had a chance to ask the owner how long did you hear a noise for. Some people aren't quite so tuned to noises sometimes or maybe there's multiple people driving the vehicle and didn't really think too much to look further at it. Let's go straight into some photos right now. We can have a look at the details of what we saw here. This is what we found when we took the brakes apart. This is inside of the brake rotor, the really badly worn edge. This is inner brake pad. This is what's left of the outer brake pad. There's still some friction material left on this pad. You can see some of it's flaked right off. This is the pad. It's worn metal on metal. These little springy clips which normally pop out. They've almost welded into place. You can just see, it's been worn for a long time like this and making a lot of noise. It would have made a lot of noise along with this. Here's a closeup of the pad. It's interesting looking at this metal. It's just transferred from the brake rotor onto the pad. It's almost comical in terms of what was going on there. Then here's, again, a closer view of the rotor itself. I know we showed pictures on other podcasts and videos. You can see a nice smooth clean rotor. This surface is normally a very nice smooth shiny metal. It doesn't look ground up like that. There's our picture show for the day. Mark: One of the things that I wonder if people realize is that brakes get extremely hot even just in regular driving. Is that right? Bernie: Oh yeah. The more you use them the hotter they get. If you're going down a steep hill, for instance, that's why they say when you learn to drive, you should pump your brakes. You don't want to hold them on continuously because the heat builds up and builds up and builds up. Whereas, if you pump the brakes and you're going down a steep hill, you put the brake on. You slow the vehicle down. Let your foot off the brake. A vehicle will speed up, but it will allow the brakes to cool a little bit, and then will heat up again. That's what you want to do. Mark: That heat buildup is what's causing that almost like soldering or welding that the two metals together onto the caliper like that. Is that right? Bernie: Exactly. The way brakes are meant to work is you have your brake disc, your rotor, and that's the hard metal piece. Then the brake pad is a softer friction material which is a sacrificial item. It's meant to wear at a certain rate and between the two they dissipate heat. 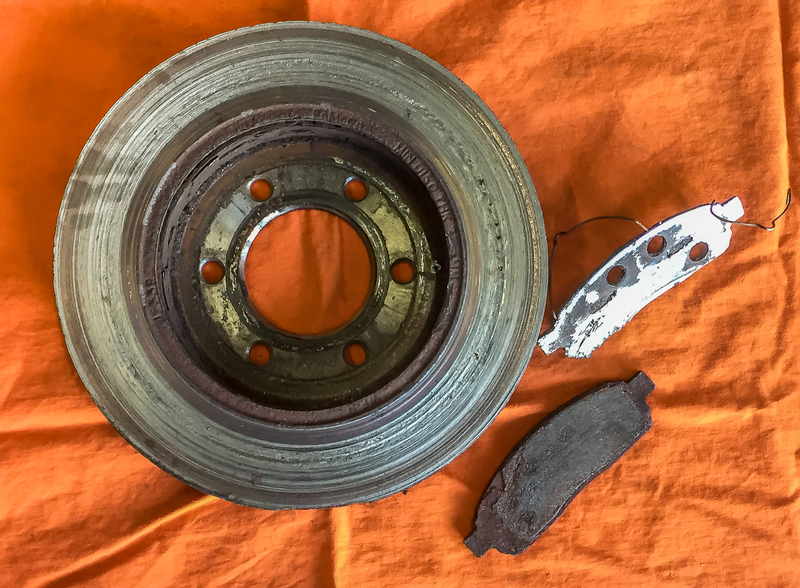 The faster you can dissipate the heat, the faster the car stops which is why if you have a high-performance vehicle you might have a brake rotor that's that big on a car that really doesn't need it. It's like a foot and a half in diameter with holes drilled through it and slots. That dissipates the heat really quickly. That's why a Lamborghini or something would have a huge brake rotor like that. The heat dissipation is key for brakes. The faster you can get rid of the heat, the quicker you can stop. Mark: Here's the hard question I guess. Is this a vehicle that you regularly service? Bernie: Yeah, we service this vehicle regularly. Usually about one a year. We inspect it, and look it over, and advise on anything. If the owner of this car is really good he'll fix and repair whatever is needed. Mark: I guess the obvious question is how is it that the brakes wore so badly in just the time between your last inspection and it being towed in? Bernie: Well, I'd say the thing about an inspection is that basically it's a snapshot of what's there now. We visually inspect a lot of things. We move things, wiggle things, move them, turn them. Things like brakes we measure so we can say, "Hey, you've got 5 millimetres on these brake pads. You should get about a year's life left out of these. What happens between the time of the inspection and the next service, which is now, is there are certain like weather. We've just gone through a winter, and then as a car gets older things that are fine now, say like a brake caliper, we can look at it. It's fine now. Something will happen. It will start sticking and seize up. That's probably what happened in the case of these brakes. We've gone through a winter. There's harsher road conditions. Salt on the road. The vehicle's getting on in age, and the caliper seizes up. These are the kinds of things that happen. Even though you have your vehicle inspected, and there's a certain timeframe where we expect to do things, you have to keep your ear open on this vehicle and go, "Hey. It that noise is happening we need to do something about it." I've had vehicles of my own where I look at them regularly, and all of sudden I'm driving, "Well, that's not right." A brake caliper seized up." It just sometimes happens without warning. You just got to deal with it. It's good to have it inspected, of course, regularly, and all things going properly, then we can time everything. Sometimes things do happen in between that we can't predict. Mark: How long do brakes typically last on these 150’s? Bernie: They're good for usually 50,000 kilometres for sure. Sometimes maybe upwards closer to 100. Certainly 50,000 for certain, assuming nothing's going to happen like a caliper seizing. This is under normal wear conditions. It also depends on what you're using the vehicle for. If you're hauling heavy weights like trailers and things, or you're loading it full of weight, that will cause your brakes to wear much quicker than it will. If you're driving down steep hills, again, a big difference. If you live in the prairies and you're in the flat all the time, the brakes will last a lot longer than they will if you live in San Francisco and you're going down those hills. Mark: Maintenance is pretty critical on any vehicle basically. Bernie: Absolutely. Regular inspections. Yeah. Mark: Another thought that occurred to me. When you're talking about a caliper seized, basically that means that it's running, the brake is on all the time. Bernie: Exactly. The caliper as I just explained is basically the piece that clamps the brake pad to the brake rotor. When you push the brake pedal down, there's fluid. It puts pressure on the fluid, and that causes the caliper, there's pistons and sliding pieces, and they will push, clamp the brake pads on. If the caliper seizes, then what happens is it doesn't release. It's like you said, it's like the brake is on all the time. That wears. You talk about heat, that wears the brakes out really fast. Usually you'll notice when a caliper starts seizing, another you'll notice is sometimes the vehicle will feel like it lacks power because you're actually trying to force a sticking wheel to move. Another thing you'll notice sometimes as well is the vehicle will pull. You brake on and instead of it just going straight, it will pull to the right or the left. That can often get a seized caliper at least on the front. Mark: There you go. If you're looking for maintenance on your vehicle, any type of vehicle in Vancouver, the guys to see our Pawlik Automotive. You can reach them at 604-327-7112. Check out their website pawlikautomotive.com. Hundreds of articles on there. YouTube Channel, Pawlik Auto Repair. Hundreds of videos on there on all makes and models, and problems, and maintenance issues for all makes of cars, and our iTunes new podcast. Thanks Bernie.